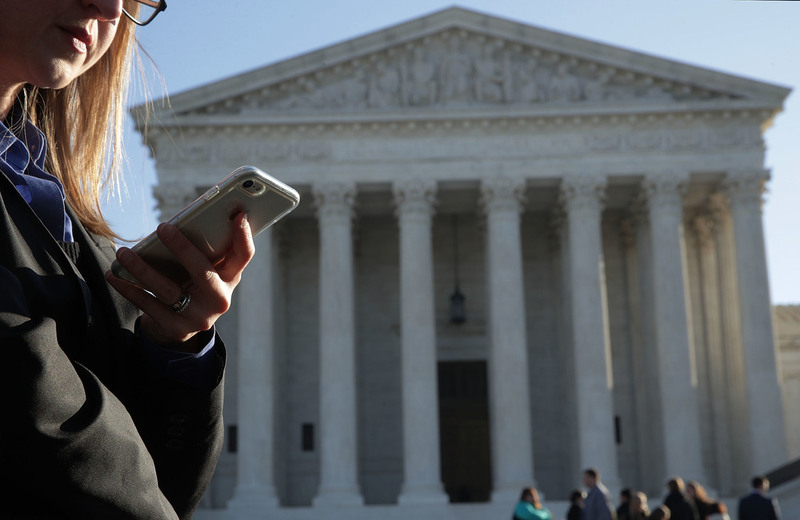 Justices May Impose New Limits On Government Access To Cellphone Data In arguments at the Supreme Court on Wednesday, a majority of justices raised concerns about privacy in the modern digital age. A woman checks her cellphone as she waits in line to enter the Supreme Court on Wednesday to hear arguments in Carpenter v. United States about the government's access to cellphone data. Inside the Supreme Court chamber, the justices seemed torn about whether to break with the so-called third party doctrine. Adopted decades ago, that doctrine says that there is no reasonable expectation of privacy when an individual shares information with a third party — for example, the phone company, which knows what telephone numbers the individual calls and receives. Therefore, police do not have to get a search warrant to gain access to those numbers. The dilemma was best illustrated when Deputy Solicitor General Michael Dreeben came to the lectern, representing the prosecution. Dreeben usually argues the government's big criminal cases in the Supreme Court. But he was detailed earlier this year to special counsel Robert Mueller's Russia investigation. It is a mark of how important Wednesday's Supreme Court case is that he was brought back to argue it before the justices. "The technology here is new," Dreeben acknowledged. "But the legal principles are not." The cellphone companies in this and other cases, he said, "function essentially as witnesses being asked to produce business records of their own transactions with customers." Chief Justice John Roberts objected that the records are "not simply created by the company." They are, he said, "a joint venture" with the individual carrying the phone. Justice Sonia Sotomayor contended that cellphones are different. "Most Americans, I think, still want to avoid Big Brother," she said, adding that while she doesn't carry her cellphone everywhere, "most young people have their phones in bed with them. ... It's an appendage." Dreeben replied that expectations of privacy "grow out of the bedrock understanding" that when a letter is mailed, the address on the envelope "is available to the government," but not the contents inside. In this case, he said, the location tracking information obtained from the wireless provider is like that address on the envelope. Justice Elena Kagan seemed to disagree, noting that cell tower records now can track an individual "24/7." But Dreeben stuck to his guns, maintaining that when people sign up with a wireless provider, they know that their locations can be tracked by cell towers. "There's an element of voluntariness" in signing up, just as there is in getting a bank account or using a debit card, he contended. Chief Justice Roberts disagreed, noting that in a recent case for which he wrote the opinion, the court ruled that having a smartphone is "not a matter of choice" in the modern digital world. People have to have one to function. Justice Neil Gorsuch seconded that thought, telling Dreeben, "It seems like your whole argument boils down to if we get it from a third party, we're OK, regardless of ... anything else." Arguing the defendant's side of the case, the American Civil Liberties Union's Nathan Freed Wessler told the justices that allowing access to cell-site location records presents the government with "a veritable time machine, an ability to press rewind" and learn where we've been over weeks and months gone by. That, he said, upends the balance of power between the people and the government that the framers of the Constitution put in place by barring unreasonable searches. Wessler, too, faced difficult questions, especially in light of the fact that prosecutors in this case did get a court order, under the 1986 Stored Communications Act, which requires a judge to sign off upon a showing that the information being sought is relevant to a criminal investigation. Justice Anthony Kennedy strongly suggested that since Congress did pass legislation governing searches like this one, the court should defer to its co-equal branch. "In an area where it's difficult to draw a line, why shouldn't we give very significant weight to Congress' determination, through the Stored Communications Act?" he said. "Frankly," he continued, it seems to me that the "normal expectation" is that wireless providers have your cellphone data. I think everybody knows that, he observed, adding ruefully, "If I know it, everybody knows it." Justice Stephen Breyer posed perhaps the most difficult question of the day, from the law enforcement perspective. He noted that at the beginning of any investigation — be it into terrorism or organized crime — law enforcement does not have enough evidence to get a search warrant. So agents start by looking at financial records, credit card records, cell tracking records and even records of website searches. To require a search warrant for all of that would be to create "an open box," Breyer warned. "We know not where we go." A previous version of this story misidentified the American Civil Liberties Union as the American Civil Liberty Union.